We are down to 1150$ which is obviously not good. 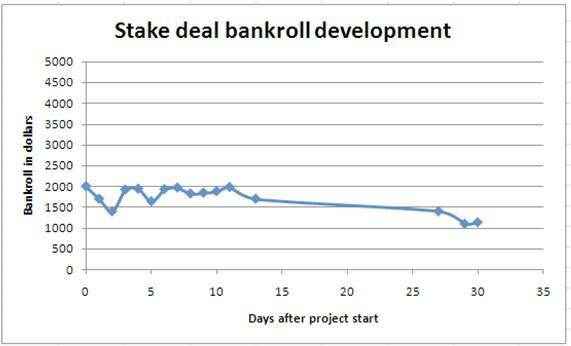 Artur took a break from poker about 11 days into the project but unfortunately it did not change his luck. Artur should take a longer break, sorry but to me, it seems he is going bad, and the only way to stop that is either enter maniac mode and pray to God for luck, or take a nice break from it all. And on that 330$ hand…tough luck , but it happens. After all poker is a game of luck. I don’t know who Arthur is, but good luck. We’ll see how it goes with the project. On a positive note I finished 40/3500 in a 11$ tournament on Poker Stars yesterday. I made a few mistakes along the way but all in all I think things are looking up.